Okay so patience isn't my strong suit - heck I even pace in front of the microwave, and it's the fastest popcorn-popping device on the planet - but what DC is doing is downright cruel. 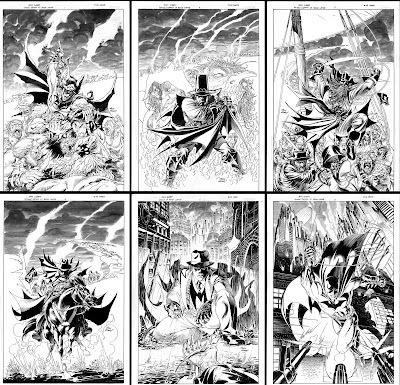 First they hook us with two simple words like 'Bat' 'Pirate' and now they drip feed us Andy Kubert's amazing covers to the impending mini Batman: The Return Of Bruce Wayne. Showcasing the different genres Bruce Wayne slips through as he works his way back to the 'super-hero' present, each is enough to make a sane fan cry 'Are we there yet?!'. Caveman Batman, Witchhunter Batman, Bat-Pirate, Cowboy Batman and Noir Detective Batman, if DC Direct hasn't already got the tie-in action figures rolling off the conveyorbelt, somebody needs to be bat-shot. 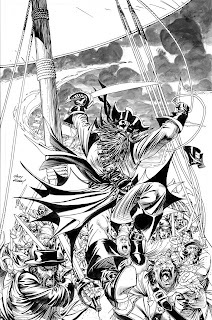 "Bat-Pirate" (Sigh) Why did DC stop the Elseworlds specials again?